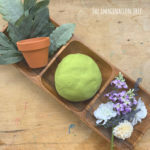 Here are my recommendations for the absolute top toys for the outdoor play area, for backyards and classroom spaces too. From trampolines and slides to play houses, sand boxes, mud kitchens and swings! 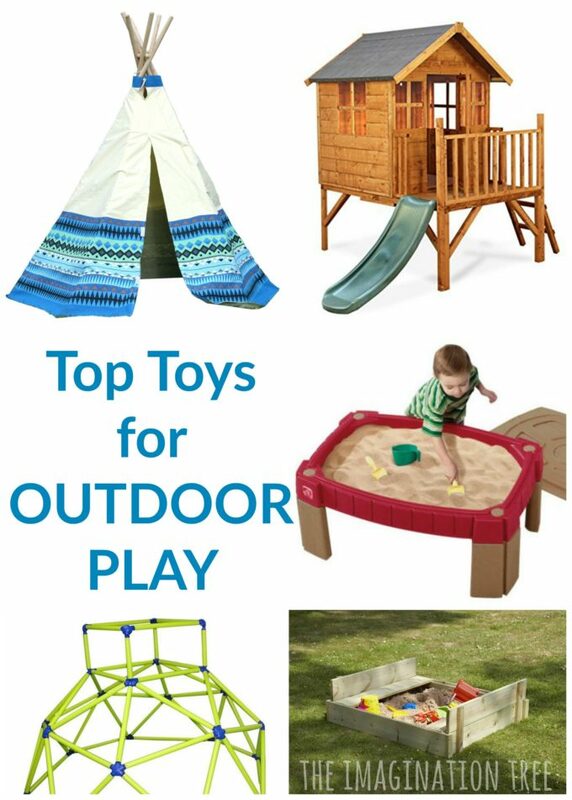 SO many inspiring ways to play outdoors this summer with these great additions to the outdoor play space. All of these great toys and play structures are items we either have ourselves at home, or I have used in the classroom. 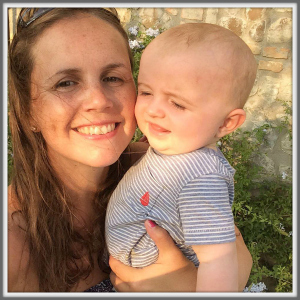 Additional items are ones my own kids have enjoyed at their friends’ houses, school or playgrounds, so we can safely say they are all truly child and adult approved! First up, a trampoline is quite simply the number one hit in our garden and is in use morning and evening nearly every, single day! 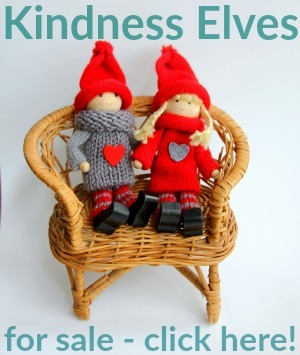 They bounce on it, dance, make up lots of imaginative play stories and read with cushions too. It’s an awesome wind down tool for burning tons of energy and keeping them super fit. 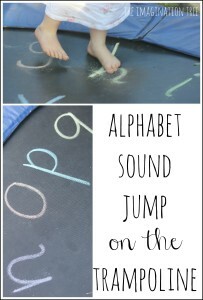 You can even do learning games on it like this phonics match and jump! Our next most used item is the sand box with the folding benches which also become the cover. This mechanism is so simple and clever. It’s a great little space for kids to get right on in and play! We’ve ended up with a few different sand and water tables over the years and they are all useful for different reasons! The first is great for all sensory play materials and can be easily accessed by a few kids at once. It’s particularly brilliant for babies and toddlers as it’s so low to the ground. 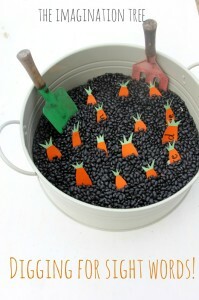 You can browse loads of our sensory play table ideas using these set ups here, for inspiration. The Step2 table is lovely as a combination table as it has space for both sand and water. The water wheel and boats it comes with are a nice addition too. Probably my favourite of all is the Tuff spot as it’s so wide, shallow and fantastically versatile for sensory play materials, sand, water and setting up small world play scenes. The frame is a must as it can be set to different heights, making this accessible to babies as well as much older kids. It’s perfect for my current age range of 1-7! These are some great and useful bags of sand and simple sand toys which every outdoor area needs to get started with! More gross motor skills toys that are awesome! The climbing frame structure is fabulous because it can be rebuilt and changed as often as your child desires, and they can become mini inventors through the process. It’s robust and great for developing motor skills and problem solving. These spinner toys are brilliant not only for physical play but also as imaginative play prompts. They can be a car, carriage, rocket, baby stroller and 100 other things! We love this playhouse with the slide down one side of the veranda and the ladder up the other. You can read our full review of it here. Every outdoor area needs a slide and see saw! These ones are very tough and durable and often end up as part of den building and other imaginative play set ups. This amazing climbing frame with swings and fort is on my wish list for when we have a bigger garden! My older kids absolutely love the monkey bars and swings and keep requesting something on this scale. For now the playground at the park will have to do! For the two weeks that we actually have a hot summer here in the UK (ha!) this paddling pool has become our favourite cool-down place. We use an electric pump to blow it up in a few minutes, then it’s ready to fill from the hose! It’s a great size for lots of kids to play together and we inevitably end up putting the slide into it too for extra fun! It’s also a great pool for putting balls into for dry, ball pit sensory play fun. 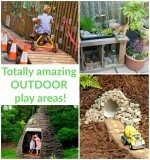 Creating real dens and nooks from natural materials are the best ways to make this kind of play-space outside. However, that’s not always a possibility at home. These gorgeous play tents are SO lovely and we have loved our floral one for many years now. On a hot day we set it up with cushions and loads of books inside, then have tea out there too as a treat. We got baby boy this lovely space themed rocket tent and crawl through tunnel set for his first birthday. These have proved very popular with all ages of visiting kids too! They’re great for imaginative play and for using as part of an obstacle course. These ride ons are the bees knees! The crazy coupe car seems to turn up in everyone’s garden or at a playgroup and there are often toddlers wresting with each other to get in and drive! The Mini Micro Scooter has been the number one item for all of our kids and from the age of about 18 months they’ve used them on every trip in the local area or to the park. They’re so much better than the other brands because of durability but also the suspension system and how it turns corners. Balance bikes are the best way to get kids used to centering their gravity and being ready for a big kids bike later on. Choosing a light weight balance/ strider bike is important so that the frame isn’t falling over all the time as they learn how to use it. Once ours mastered the strider, they moved onto the mountain bikes and these are the best for park trips and taking to off road bike tracks too. 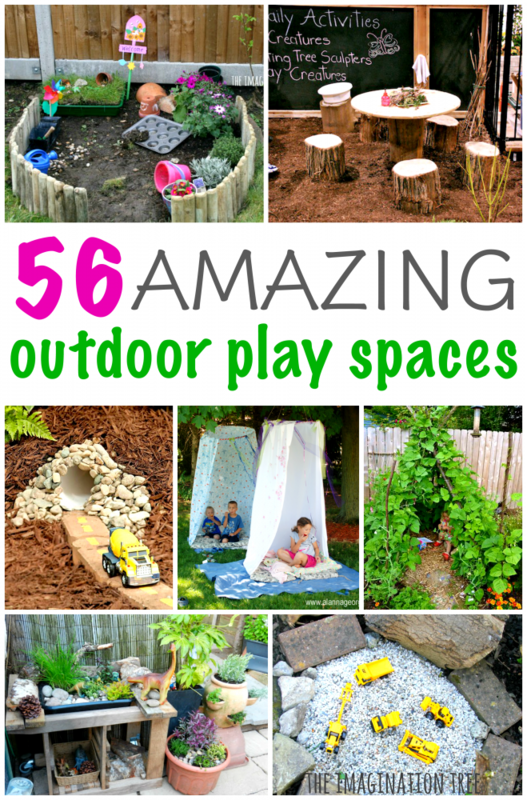 Visit this HUGE collection of outdoor play spaces that will inspire the socks off you! There are dens, nooks, DIY play frames, nature playgrounds, streams, dinosaur gardens, boat sand pits, tree houses, bean teepees and lots more to choose from! You can also follow our OUTDOOR PLAY and LEARNING pinterest board for more ideas too! Here’s to a long and wonderful summer, filled with plenty of play time outside in the glorious sunshine! 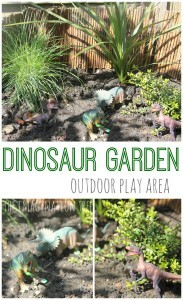 I hope these top toys for the outdoor play area have been a good starting point and a help in designing your backyard play spaces!